The coup d’état against Mali’s democratically elected government in march this year following the slide of the country’s north into the secessionist state of Azawad marked the latest alarming signal for security experts concerned with the region’s stability. While much has been written on the impact Qaddhafi loyalists and the former Lybian leader’s enormous weapon store have had on neighbouring countries, little is known about other parties’ activities in the vast desert areas of Northern and Cental Africa. In this long-term analysis, Jacob Mundi* portrays the Sahara as a safe haven for drug smugglers and various terrorist groups but also gives detailed inside in US engagement. The region’s abundance in oil and other natural resources has done its own part in sparking further clashs of interest. Since 2002, the US government has been pursuing a series of counter-terrorism initiatives in Northwest Africa’s Sahara-Sahel region. These measures began with the Pan-Sahel Initiative (PSI), to ‘assist Mali, Niger, Mauritania, and Chad in protecting their borders, thus supporting the U.S. national security interests of waging war on terrorism and enhancing regional peace and security’. 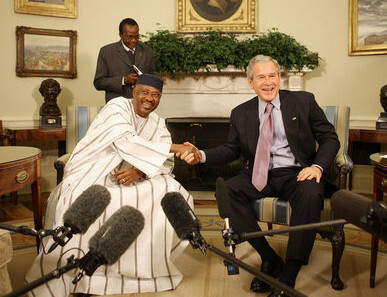 In 2005, the United States reformulated the PSI into the half-billion dollar Trans-Saharan Counterterrorism Initiative (TSCTI), ‘designed to provide a regional response to terrorism by offering a balanced program of military assistance, intel[ligence] sharing, democratization and good governance support, and humanitarian aid’. The TSCTI also expanded the scope of participation, bringing Algeria, Burkina Faso, Morocco, Senegal and Tunisia into the project. The 2010 budget request for the re-branded Trans-Saharan Counter Terrorism Partnership (TSCTP) was $80.3 million. In the brave new world after 11 September 2001, this is small beans for a US development-security outlay; it represents just two percent of the 2010 development budget for Afghanistan (the State Department’s side of the civil-military counter-insurgency effort) or what the Pentagon plans to spend on Iraq and Afghanistan every six hours in 2010. The TSCTP is described in US government documents as ‘a multi-faceted, multi-year strategy aimed at defeating terrorist organizations by strengthening regional counter-terrorism capabilities, enhancing and institutionalizing cooperation among the region’s security forces, promoting democratic governance, discrediting terrorist ideology, and reinforcing bilateral military ties with the United States’. Apparently the TSCTP has been so successful that its ‘best practices’ have also been adapted to the East Africa Regional Strategic Initiative, a similar counter-terrorism program focusing on the Horn. Despite this commitment from the US government to the Sahara-Sahel, there is no consensus among policy makers, observers, regional governments and locals on-the-ground as to the ultimate rationale for these security initiatives. The primary justification for the US militarization of the Sahel is the existence of a small number of self-proclaimed ‘Islamist’ groups operating in the deserts connecting Mauritania, Mali, Burkina, Niger, Algeria, Tunisia, Chad and Libya, not to mention groups already active in northern Morocco Algeria, Tunisia and Libya. Debate has focused on whether or not these armed groups, individually or taken as a dis-articulated whole, present a potential and significant threat to local and international interests. There are those arguing in the positive (Lyman & Morrison 2004; Cline 2007; Hunt 2007; Scheuer 2007; Mohsen-Finan 2008); those expressing skepticism or agnosticism about the existence or extent of the threat (International Crisis Group 2005; Obi 2005; Archer, Popovic 2007; see the Ellis & Keenan  debate; Mcdougall 2007b; Mcdougall 2007a; Jourde 2008a; Jourde 2008b); and those expressing doubt about the actual existence of any real armed Islamist movement in the Sahara federated to al-Qa‘idah, besides the one fabricated by regional and extra-regional intelligence agencies (Gèze, Mellah 2007; Keenan 2009). According to the most routine narrative, the presence of terrorists in the Sahara owes to a confluence of (1) spill over from the armed conflict in Algeria in the 1990s, (2) from ‘Jihadists’ fleeing Afghanistan following the 2001 US invasion (see Map 1) and, more recently, (3) experienced fighters trained in new terrains of US occupied Iraq and Afghanistan. These groups initially coalesced under the already existing Salafi Group for Preaching and Combat (GSPC, Groupe salafiste pour la prédication et le combat), a surprisingly durable remnant of the armed conflict in 1990s Algeria. The long insinuated flirtation between the GSPC and al-Qa‘idah was finally consummated in 2007 with the alleged blessing of none other than Osama bin Laden; the GSPC rechristened as an official branch of al-Qa‘idah in Northwest Africa. Foreign observers do not seem quite sure about their official name, but most have settled upon al-Qa‘idah in the Islamic Maghrib, perhaps because it makes a nice acronym in French (AQMI, Al-Qaida au Maghreb islamique) or in English (AQIM), one that seems to echo the name of other al-Qa‘idah branches — e.g., AQAP, Al-Qa‘idah in the Arabia Peninsula, and AQI, Al-Qa‘idah in Iraq. Pressed by Algerian counterterrorism successes, the once Algeria-centric GSPC has become a regional terrorist organization, recruiting and operating all throughout the Maghreb — and beyond to Europe itself’ (quoted in Hansen & Vriens 2009). The European Police Office (Europol) has likewise come to the conclusion that the GSPC-AQMI poses a potential threat to Europe, especially the northern Mediterranean rim (see European Police 2008). For example, apparent capacity of Saharan armed Islamist groups to actually inflict any serious damage on the local security forces or mount any logistically sophisticated operations appears quite limited. This is not to minimize the loss of life in northern Algeria, where, for example, there were massive bombings in April and December 2007 (the latter claiming the lives of several of my friends’ colleagues); nor in the Sahel, where local security forces have been targeted (e.g., the GSPC reportedly killed fifteen Mauritanian soldiers near Lemgheity in June 2005); and some foreigners, likewise, have been killed. But apart from high-profile, low damage attacks against ‘Western’ targets and even less frequent attacks on local security forces, the actual threat posed by GSPC-AQMI to local and foreign interests appears quite limited (International Crisis Group 2005). Moreover, of all the established and emergent threats to security in the Sahara-Sahel — poverty, weak states, ethnic tensions, corrupt governance and, especially, climate change (Hershkowitz 2005; Jebb et al. 2008) — confronting a handful of terrorists seem like a misplaced priority to some (Obi 2005). One strand of securitization theory proposes that there are no given security threats but only successful and unsuccessful efforts to ‘securitize’ issues as concerns to be addressed primarily through a lense of national defense. For example, as some news reports noted in April 2010, childhood obesity rates were designated a ‘security threat’ to the United States because it limited the pool of applicants for military service. More seriously, the securitization (qua militarization) of development discourse and practice entails, in the US context, the Pentagon’s appropriation of humanitarian and development outlays. And, as frequently noted in the ‘war on terror’, militarization and privatization now go hand in hand, given the extent to which private contractors now constitute a second skeleton in the US military infrastructure, performing tasks ranging from logistics to covert war fighting. But securitization theory also addresses the nature of security, questioning the utility of militarizing all that is deemed important to a society’s prosperity. Indeed, one of the most profound insights of securitization theory was the simple observation that militarizing priorities might be counter productive to actually achieving those goals. In the world after 11 September 2001, it is not surprising to see various officials play the terrorism card for institutional gain; indeed, the total hegemony of terrorism as the ultimate securitizing utterance is impossible to deny. The fact that terrorism can now be asserted as a threat, rather than proven, is demonstration enough. Meanwhile, the very real challenge of changing environments, partially induced by global warming, have manifested all along the entire Sahel for years. A 2007 report of the UN Environmental Program (UNEP) came to the conclusion that a significant contributing factor to the conflicts in Sudan, especially the Darfur region on the eastern edge of the Sahel, is a multi-dimensional environmental crisis. As the UNEP’s Sudan Post-Conflict Assessment reported, ‘forecast climate change is expected to further reduce food production due to declining rainfall and increased variability, particularly in the Sahel belt. A drop in crop yields of up to 70 per cent is forecast for the most vulnerable areas’. Other interlocking factors include desertification (spreading 100 kilometers south in the last forty years), significant declines in rainfall (30% in northern Darfur), deforestation (approaching 100% in some areas in the next ten years) and stress from human and animal populations. Niger, which seems to be at the epicenter of recent ‘terrorist’ activity linked to AQMI, also happens to be at another epicenter: the massive environmental change sweeping the Sahel. In a region of the world where rainfall means the difference between life and death, Niger saw a 70% drop in average precipitation in 2009. Having just faced a famine in 2005 that affected 3.5 million people, Niger is now asking the international community to help it confront a new famine that, according to Oxfam, will affect two to three times as many children, women and men, especially in the Zinder and Maradi regions. Populations in Chad, Burkina Faso and Mali are also expected to suffer (Agence France Presse, 21 April 2010). As UN Secretary-General Ban Ki-moon noted on World Water Day, more people die from lack of water than all forms of violence, armed conflict included. On the one hand, we should be careful not to countenance too strongly a neo-Malthusian worldview in which conflict and local environments are so intimately linked that we absolve important intervening variables, such as the rapacious development ‘needs’ of Europe, North America and Australia, whose responsibility for the global environmental crisis is overwhelming (see dabte on ‘violent environments’ in ECSP 2003: 89-96). On the other hand, we nonetheless need to consider whether or not alternative identities (i.e., Islam), ‘radicalization’ and black market activity pose the greatest threat to human security there. Even researchers associated with the US military have come to recognize the importance of considering the natural environment as warranting more attention within a holistic security framework (Jebb et al. 2008). A slide from a US Marine Corps briefing describes the ‘Future Security Environment’ — predicted to last for at least the next two decades — as one of ‘“Hybrid” threats and challenges’; hybrid in that they combine traditional, irregular, catastrophic (e.g., mass terrorism) and disruptive (e.g., cyber attacks) modes of war. The new space of security spans an ‘arc of instability’ encompassing most of Central, Southwest and Southeast Asia; southeast Europe; almost all of Africa (except South Africa); as well as Central and most of South America. Essentially, the Global South — a majority of the world’s population minus China. As the slide notes, this area not only includes nuclear-armed states, major illicit drug production centers and ‘anti-West attitudes’, but also the ‘top ten oil reserves’. Ironically (or not) this briefing predicts threats emanating ‘largely in the littorals’. The term Sahel means littoral or shore in Arabic (al-sahil). The Sahel is the southern ‘shore’ of the Sahara desert, often described as a savanna spanning the Atlantic (Mauritania-Senegal) to the Red Sea (Sudan). The position of the Sahara-Sahel region in the US ‘arc of instability’ is as much determined by the perceived threat of AQMI’s activities and the confluence of the security discourses of weak/failed states, ungoverned spaces and terrorist safe havens. Even if AQMI poses little threat to African or Western interests in the Sahara region, initiatives such as the TSCTP are still justified, some argue, because they seek to prevent terrorist groups from coalescing into an actual threat (see Ellis 2004; Mohsen-Finan 2008). The current focus of US imperial engagement worldwide is certainly Afghanistan and Pakistan. The Obama administration is engaged in an inherited Sisyphean effort to prevent, ostensibly, the re-establishment of an al-Qa‘idah safe haven. It is this rationale — the safe haven threat (see Innes 2007) — that allegedly distin-guishes the war effort there as one of necessity. And yet this rationale — the self-mandated warrant to prevent the establishment of terrorist safe havens — is foundational to the United States’ post-11 September 2001 security activities in the Sahara-Sahel. Terrorists are stateless and so counter-terrorism should follow suit. But what Walt fails to realize, and what is most disturbing about current US counter-terrorism policy, is that the drive to prevent safe havens is not based on what we know but rather what cannot be known: the future where we don’t intervene to prevent the terrorism we think might happen. The performance of counter-terrorism is now paramount because no democratically elected politician wants to be seen has having done nothing about terrorism the next time there is an attack. If terrorism poses a threat to anything, it is political incumbency in Liberal-Western democratic polities. And so the killing and wasted resources — important conditions of possibility for terrorism — continue unabated. Besides, what use is the world’s most expensive military if it cannot win ‘new’ wars? The shadow of Vietnam, indeed, looms larger than opponents of the Afghanistan war suspect. intervention during the Cold War and afterwards — Afghanistan and Somalia. In terms of the most basic geographic and demographic dimensions, any analogy between ‘Af-Pak’ and the Sahara-Sahel must contend with some stark realities. Together, Afghanistan and Pakistan cover roughly 593,00 square miles; the Pashtoon population, the dominant social milieu of the Taliban, number forty million. The Sahara desert, on the other hand, which includes six of Africa’s eleven largest countries (Algeria, Chad, Libya, Mali, Mauritania, Niger), covers 3.5 million square miles. Algeria, Africa’s second largest country, is nearly one million square miles, or one and a half times the size of Afghanistan and Pakistan combined. Afghanistan and Pakistan could likewise fit inside Libya with room to spare. The population of the Sahara — i.e., excluding Northwest Africa’s Sahel and Mediterranean rim — is, as many might expect, miniscule. The entire population of Mauritania, the most Saharan country in the region, is roughly 3.5 million, the majority inhabiting the cities of Nouakchott (the political capital) and Nouadhibou, (the economic capital). The contested territory of Western Sahara boasts one of the lowest population densities in the world. And like the much-vexed ‘tribal areas’ of northern Pakistan, the Sahara has its own special place of interest. Tuaregs call it the Azawagh/Azawak, an area of 31,000 square miles roughly bounded by the triangle of Algeria’s Hoggar mountains, Mali’s Adrar des Ifoghas and Niger’s Aïr massif. Even this confined theatre of interest in the US militarization of the Sahara boasts a population of less than five persons per square mile. 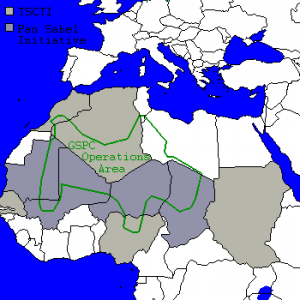 Early maps of the GSPC threat in the Sahara, like those created to support the Pan-Sahel Initiative, show ‘Terrorist Organizations Operating Throughout the Sahel’ (Map2) and ‘Area of GSPC operations’ (Map3). What is interesting about this map is not only the apparently extensive reach of the ‘Terrorist Area’, but the very peculiar way in which it touches all the right countries. It neatly includes Morocco by distending into southeast Morocco’s Draa valley (where no terrorist activity has taken place and the border with Algeria is well patrolled). Even more astutely, this zone avoids either the Moroccan occupied Western Sahara (perhaps the most militarized region in the Sahara) or the section of Western Sahara under the nominal control of that territory’s Frente Polisario independence movement. Western Sahara, of course, cannot be included in US counter terrorism practice because, as Yahia Zoubir’s contribution makes clear, it is illegally occupied by Morocco and no country in the world recognizes Moroccan sovereignty over the territory. This raises the question: Is the policy mapping the threat or the threat is mapping the policy? A practice whereby ‘the imagination of place creates political and spatial realities’ (Bialasiewicz et al. 2007). Or, as Konstantina Isidoros suggests, the US impetus to ‘script-write a mythology of terror onto a Saharan landscape’. Only a year ago, a New York Times assessment of US counter-terrorism initiatives in Northwest Africa had asked the same question, noting that the trend in terrorist activity seemed to be going up rather than down since the PSI in 2003 (Schmidle 2009). With respect to US counter-terror policies in the Sahara-Sahel, Greg Mills (2004:166), national director of the South African Institute of International Affairs, suggested, ‘There are, moreover, dangers that such security measures [as the PSI] may, at least in the short term, exacerbate the conditions that give rise to external and internal terrorism in the first place’. Related to this problem is one of the hot new key words in the study of terrorism: radicalization. As terrorist acts become increasingly orchestrated by smaller and smaller cells, down to lone individuals, the processes through which people and groups become ‘radicalized’ has now become central to the discourse on terrorism, particularly the issue of Islamic radicalization. A once-thriving tourism industry that sustained local businesses and artisans is now decimated in the Saharan caravan capital Agadez, reduced to little more than a stopover for African migrants and internal refugees heading north toward Libya and, for a lucky few, Europe.’ (Armstrong 2010). The fact that the main effect of the alleged activities of the GSPC-AQMI has been the near annihilation of Saharan tourism has helped engender counter-narratives of the recent securitization of the Sahara, vocalized by both domestic actors and foreign observers. Often dismissed as advancing conspiracy theories, skeptics nonetheless believe that there are interests — either large and/or small, global and/or local — who would rather not have Europeans cavorting around in their Landrovers, running into the underbelly of the Saharan economy. According to such critics, the threat posed by armed Islamist groups in the Sahara is either a product of manipulation by regional state actors (for local or national gain) or a synthetic phenomena with no basis in reality, manufactured to provide a basis for foreign intervention. Yet the purchase of the counter-narrative of Saharan terror, like so many conspiracy theories, comes not from bulletproof evidence to the contrary, but rather from the inconsistencies and lacunas of the dominant narrative advanced by governments in the region, in Europe and in North America. The visible shortcomings of the primary (actual threat) and secondary justification (potential threat) for increased US security presence in the Sahara-Sahel have provoked speculation that an alternative rationale must be operating. Given the geographical coincidence between US security measures in the Sahara and some of the world’s most important energy reserves, critics have alleged that the deep logic behind the TSCTP is geo-strategic or ‘imperial’. With Algeria and Libya to the north, and Nigeria and the Gulf of Guinea to the south, the Sahara-Sahel rests between two spaces of supreme strategic interest to the United States, Europe and, increasingly, China. Indeed, Chinese encroach¬ment into Africa has been cited as another important factor in the increased US security attention. A similar critique has been launched at related US efforts to establish a military command for Africa (Africom). Perhaps the most well known skeptic of the Saharan terrorism threat is British anthropologist Jeremy Keenan, a social scientist whose four decades of on-the-ground experience in the heart of the Sahara, coupled with an impressive publication record, is unrivaled in the Anglophone academy. For Keenan, the GSPC and, now, AQMI, represent nothing short of a sophisticated false-flag intelligence operation perpetrated by the Algerian secret services to help advance the cause of US imperialism in West Africa. For Keenan (2009), the series of seemingly implausible events triggered by the 2003 kidnapping of thirty-two European tourists in Algeria, coupled with his claims of having monitored the situation on the ground at the time, is the original source of his incredulity. Keenan has since concluded that their kidnapping ‘was conducted and orchestrated by the DRS [Algeria’s military intelligence], but with the knowledge and collusion of the US. In essence, they took 32 Europeans hostage and claimed it to be the work of Islamic extremists’. The US government, specifically the Pentagon under Defence Secretary Donald Rumsfeld, colluded with the Algeria’s military intelligence to ‘fabricate[...] terrorism to legitimise a new front on the War on Terror in Africa and hence the US’s militarisation of the continent’. Keenan believes that the myth of Saharan terrorism is not only central to the warrant for the PSI and TSCTI/P, but now constitutes a significant rationale behind the creation of Africom. As recent US government figures show, petroleum imports to the United States are dominated by Canada and Mexico. The rest of the top ten, however, reads like a cartography of US strategic engagement: Number ten is Colombia (a major recipient of US aid in the ‘war on drugs’), bordering Venezuela, number five, and Brazil, number nine. Number four and six are Saudi Arabia and Iraq, respectively, whose centrality to US interests and military action needs no background. However, it is number three (Nigeria) and seven (Algeria) that Volman is gesturing towards in his critique of Africom. Nigeria and Algeria are the only African countries among the top fifteen world oil producers. While OPEC partners Algeria, Angola, Libya and Nigeria dominate the African production, non-OPEC West African oil production also includes contributions from Cameroon, Chad, Côte d’Ivoire, Equatorial Guinea, Gabon and newcomer Mauritania. A July 2009 Algerian-Nigerian agreement to devote US $10 billion towards a 4,128 kilometer (2,565 mile) trans-Saharan gas pipeline — roughly the distance between San Francisco and Washington, DC — has only enhanced suspicions that the geographical coincidence of mass energy reserves and terrorism is more than mere coincidence. The likely route of any such pipeline will likely track through Niger, which is itself a giant in the world of energy production. Niger, as one news story recently noted, is ‘confronting a political crisis caused by allegations of corruption and environmental conflicts — all linked to the uranium mines’ (Godoy 2010). Though you could not tell it from the annual UN Development Program’s reports, which regularly locate Niger as the world’s poorest nation, the deposits around Arlit in northwest Niger make that nation the largest exporter of high-grade uranium in Africa and among the top five in the world. A phenomena otherwise known as the resource curse or the paradox of plenty. But what citizens of the United States know about Niger, thanks to former Ambassador to Niger Joseph C. Wilson, is that Sadam Hussein actually did not try to buy yellowcake there. What Areva — a French government owned multi-national conglomerate responsible for mining uranium in Niger — likely knows is that ‘Niger is to the nuclear industry what Saudi Arabia is to the oil industry’ (Meyer 2010). And it just so happens that those mines lie in the heart of Tuareg lands in northern Niger, the site of the most recent Tuareg insurgency in 2007 and 2009 of the Mouvement des Nigériens pour la justice (MNJ, Movement of Nigeriens for Justice). With the ‘greening’ of nuclear power in full swing, as the world desperately searches for post-carbon sources of energy to fuel the West’s over-development, northern Niger will continue to sit in the eye of a global storm. From the Romans to European colonialism to the TSCTP, the Sahara has always been ostensibly periph¬eral yet clearly central to the grand designs of those seeking to influence the fate of Africa. If anything, it is hoped that this collection of essays sheds new light and, eventually, brings fresh eyes to a series of securitizing practices occurring on the ‘margins’ of empire, generally (Hardt & Negri 2001), and US hegemony, specifically (Agnew 2005; Charbonneau 2008; David & Grondin 2006; Harvey 2005; Khalidi 2004). * The author: Jacob Mundi first published this analysis in Concerned Africa Scholars, Bulletin No. 85, 2010 (read the full bulletin) as an PhD candidate at the University of Exeter’s Institute of Arab and Islamic Studies. He is co-author of Western Sahara: War, Nationalism and Conflict Irresolution (Syracuse University Press) with Stephen Zunes. I would like to thank the contributors for their insightful essays and their patience over the course of the last six months as this collection slowly came together. Thanks to Tim Scarneccia for editorial assistance. 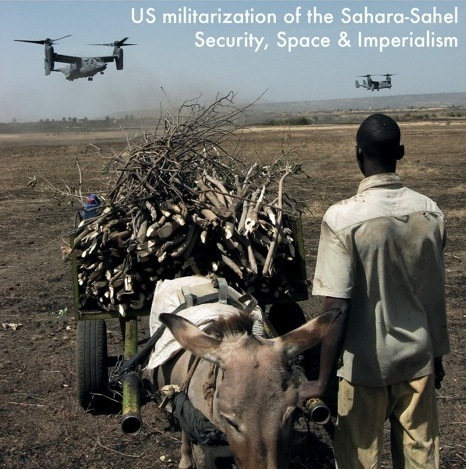 Images used throughout this bulletin, including the cover, were produced by the US military; they were obtained from http://www.defenseimagery.mil/index.html and http://www.africom.mil. Other graphics for this introduction were obtained from http://www.globalsecurity.org and other authors who distributed their work under Creative Commons-license. Agnew, JA. 2005. Hegemony: the new shape of global power. Philadelphia: Temple University Press. Archer, T and T Popovic. 2007. The Trans-Saharan Counter-Terrorism Initiative. Helsinki: Finnish Institute of International Affairs. Armstrong, H. 2010. Niger coup: Good for tuareg rebels, bad for uranium investors. 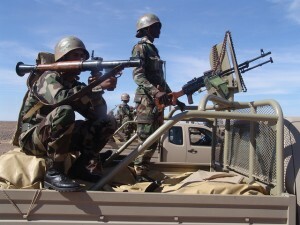 Christian Science Monitor, 23 March: http://www.csmonitor.com/World/Africa/2010/0323/Niger-coup-Good-for-Tuareg-rebels-bad-for-uranium-investors. Bialasiewicz, L, D Campbell, S Elden, S Graham, A Jeffrey and A Williams. 2007. Performing security: The imaginative geographies of current US strategy. Political Geography 26: 405-422. Charbonneau, Bruno. 2008. France and the New Imperialism : Security Policy in Sub-Saharan Africa. Aldershot and Burlington: Ashgate. Cline, LE. 2007. 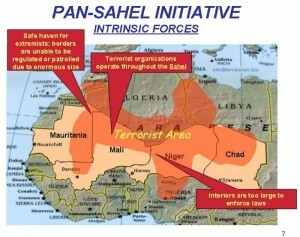 Counterterrorism Strategy in the Sahel. Studies in Conflict & Terrorism 30(10): 889-899. David, CP and D Grondin (eds). 2006. Hegemony or empire? : The redefinition of US power under George W. Bush. Alder¬shot and Burlington: Ashgate. Ellis, S and J Keenan. 2007. The Sahara and the ‘War on Terror’. Anthropology Today 23(3): 21-22. Ellis, S. 2004. Briefing: the pan-Sahel initiative. African Affairs 103(412): 459-464. Environmental Change and Security Project (ECSP). 2003. ESCP Report 9. Washington, DC: Woodrow Wilson Center for International Scholars. European Police. 2008. TE-SAT 2008: EU Terrorism Situation and Trend Report. European Police Office. Fiengold, Russ. 2009. Remarks of US Senator Russ Feingold. Hearing on Counterterrorism in Africa’s Sahel Region, 17 November: http://www.africom.mil/getArticle.asp?art=3735. Gèze, F and S Mellah. 2007. «Al-Qaida au Maghreb», ou la très étrange histoire du GSPC algérien. Berlin: Algeria Watch. Godoy, J. 2010. French state-owned company ‘poisoning’ poor. Inter Press Service, 12 April: http://www.ipsnews.net/news.asp?idnews=50999. Gutelius, D. 2007. Islam in Northern Mali and the War on Ter¬ror. Journal of contemporary African studies 25(1): 59-76. Hama, Boureima. 2010. ‘Southern Niger villagers helpless against famine’, Agence France Presse, 21 April. Hansen, A. and L. Vriens. 2009. Backgrounder: Al-Qaeda in the Islamic Maghreb (AQIM) or L’Organisation Al-Qaïda au Maghreb Islamique (Formerly Salafist Group for Preaching and Combat or Groupe Salafiste pour la Prédication et le Com¬bat). Council on Foreign Relations. 21 July 2009: http://www.cfr.org/publication/12717/. Hardt, M and A Negri. 2001. Empire. Cambridge, MA: Harvard University Press. Harvey, D. 2005. The new imperialism. Oxford and New York: Oxford University Press. Hershkowitz, A. 2005. The Tuareg and Mali and Niger: The Role of Desertification in Violent Conflict. Washington, DC: Inventory of Conflict and Environment, American University. Homer-Dixon, T and J Blitt. 1998. Ecoviolence: Links Among Environment, Population, and Security. Lanham, Maryland: Rowman & Littlefield. Hunt, E. 2007. Islamist Terrorism in Northwestern Africa: A ‘Thorn in the Neck’ of the United States? Washington, DC: The Washington Institute for Near East Policy. Innes, MA (ed). 2007. Denial of sanctuary: Understanding terrorist safe havens. Westport: Praeger. International Crisis Group. 2005. Islamist Terrorism in the Sahel: Fact or Fiction? Brussels: International Crisis Group. Jebb, CR, LJ Hummel, L Rios and MA Abb. 2008. Human and Environmental Security in the Sahel: A Modest Strategy for Success. Environmental Change and Human Security: Recognizing and Acting on Hazard Impacts. PH Liotta, DA Mouat, et al. (eds). New York: Springer: 341-392. Jourde, C. 2008a. Au Sahel, la ‘guerre au terrorisme’ entre réalité et fictions. L’État du monde 2009. B Badie and S Tolotti (eds). Montréal: La Découverte / Boréal: 276-282. Jourde, C. 2008b. The master is gone, but does the house still stand? The Fate of Single-Party Systems after the Defeat of Single Parties in West Africa. Political Transitions in Dominant Party Systems: Learning to Lose. E Friedman and J Wong (eds). Oxon and New York: Taylor & Francis: 75-90. Keenan, J. 2009. 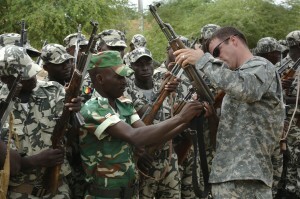 The Dark Sahara: America’ s War on Terror in Africa. London: Pluto. Khalidi, R. 2004. 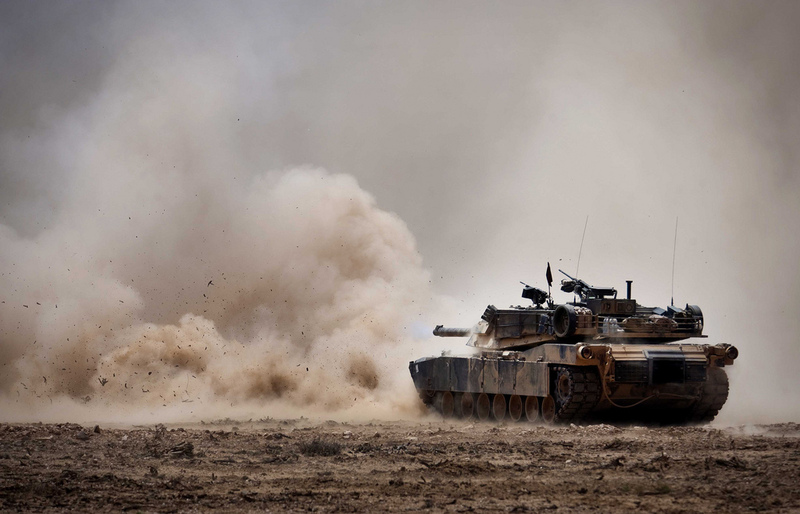 Resurrecting empire: western footprints and America’s perilous path in the Middle East. London and New York: I.B.Tauris. Lyman, PN and JS Morrison. 2004. The terrorist threat in Africa. Foreign Affairs 83(1): 75-86. Mcdougall, EA. 2007a. Constructing Emptiness: Islam, Violence and Terror in the Historical Making of the Sahara. Journal of Contemporary African Studies 25(1): 17-30. Mcdougall, EA. 2007b. In the Eye of the Beholder: Provocation, Promise and Prayer in the Sahara-Sahel. Journal of Contemporary African Studies 25(1): 1-15. Meyer, C. 2010. Uranium Mining in Niger: Tuareg Activist Takes on French Nuclear Company. Der Speigel, 2 April: http://www.spiegel.de/international/world/0,1518,686774,00.html. Mills, G. 2004. Africa’s new strategic significance. The Wash¬ington Quarterly 27(4): 157-169. Mohsen-Finan, K. 2008. Les défis sécuritaires au Maghreb. Paris: Institut français des relations internationales. Obi, CI. 2005. Terrorism in West Africa: Real, emerging or imagined threats? African Security review 15(3): 87-101. Peluso, N and M Watts. 2001. Violent Environments. Ithaca: Cornell University Press. Pillar, PR. 2009. Who’s afraid of A terrorist haven? Washington Post. 16 September: http://www.washingtonpost.com/wp-dyn/content/article/2009/09/15/AR2009091502977_pf.html. Sanger, DE. 2010. U.S. Pressure helps militants overseas focus efforts. New York Times. 7 May 2010: http://www.nytimes.com/2010/05/09/weekinreview/09sanger.html. Scheuer, M. 2007. Al-Qaeda and Algeria’ s GSPC: Part of a much bigger picture. Terrorism Focus 4(8): 4-6. Schmidle, N. 2009. The Saharan conundrum. New York Times. 15 February 2009: http://www.nytimes.com/2009/02/15/magazine/15Africa-t.html. US Department of State, 2005-2010. Bureau of Resource Management, Congressional Budget Justification for Foreign Operations. Washington, DC: US Department of State. Walt, SM. 2009. The ‘safe haven’ myth. Foreign Policy. August 18: http://walt.foreignpolicy.com/posts/2009/08/18/the_safe_haven_myth. Zulaika, J. 2003. The self-fulfilling prophecies of counterter¬rorism. Radical History Review (85): 191-199.